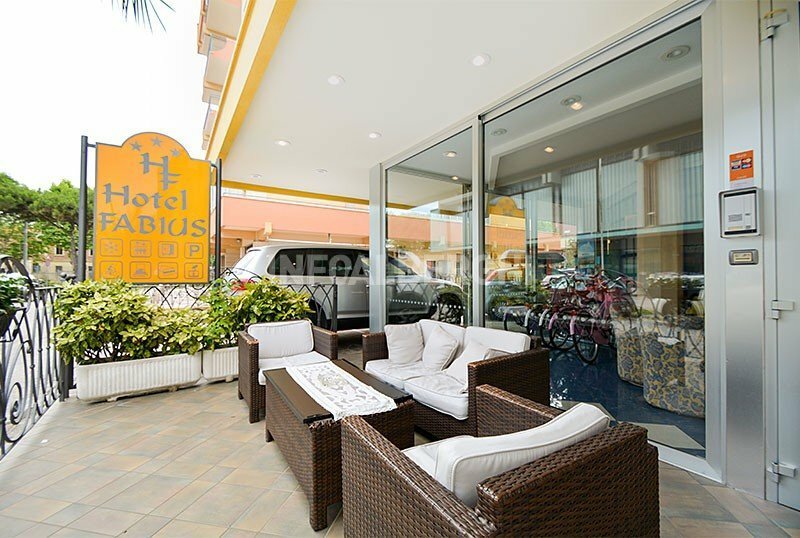 A few steps from the sea, the Fabius is a family-run three star hotel in Bellaria, which offers entertainment on the beach, strollers available, free use of bicycles, WI-FI, parking and air conditioning. Small pets are welcome. The hotel is located in a closed street that leads to the beach. The area is quiet and with little traffic. The sea is a 2-minute walk away. It takes just 10 minutes to get to the center. The rooms have a balcony with sea view, air conditioning, WI-FI, Sky satellite TV and digital terrestrial, safe, direct dial telephone, minibar on request and private bathroom with shower, complimentary toiletries and hairdryer. Open-air porch, 12 bikes available, American bar, large living rooms, elevator, reading room and entertainment. PARKING: covered available 5 seats, open 30. Both free. 5 parking places in the garage, subject to charges. BREAKFAST: international with sweet and savory dishes. LUNCH AND DINNER: choice menu with homemade pasta and desserts and a buffet of vegetables and appetizers. Water, wine and soft drinks at meals. At meals: seats at the table, baby menu, baby food. On the beach: live entertainment, games for children. The hotel has an agreement with Bagno 32 Pierino, which is just a few steps away from the hotel. The list prices are per person per day and are full board. TOURIST TAX: excluded, € 0.70 per person per day for a maximum of 7 days. - Reservations are based on a deposit of € 150.00 per room. Book now your holiday choose our special offer also valid for couples.